via email from Kim Hawley, 6-10-08 Charles Miller Hawley's second wife's name was Anna Gertrude Rogers Hawley, who was my grandmother, and she was born and raised outside of Worcester, MA. He had a first wife who got tired of his rather unsettled and unorthodox lifestyle, and they parted ways--reasonably amicably, from what I understood. He had a daughter, Vera, from that first union. I have next-to-nothing in terms of paper, and the few photos I have of my grandmother are in her old age and probably wouldn't help much (really, at all)--she was slim and "tall" (meaning she wasn't five feet--maybe five six or so)--I know she was "quite a looker" in her day, but all of her stuff just went missing. It's frustrating. I don't have a single photo of Charles Miller Hawley, and I'd dearly love one, too. Anna's story is pretty amusing, in and of itself. She wanted adventure and took off to be a Harvey Girl. She and her girlfriend Mary (last name lost to time) took off and went west. They went, specifically, looking for husbands. Mary found a husband first, and, next thing you know, Anna is no longer a Harvey Girl and she's playing piano in the movie house (silent films) in Bisbee, AZ, which is where she met and married Charles Miller Hawley. 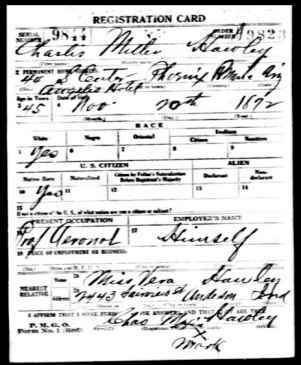 filled out on 9/12/1918, when Charles was forty five years old. As you can see (hopefully--it is a JPEG image) his present occupation is listed as "PROF AERONOT" (I love the creative spelling!) and his employer is listed as HIMSELF. He had apparently hurt his right hand, and was unable to sign the form, which is noted on the second page. He was tall and slender, per the form (pity some genetic traits don't get passed down!). 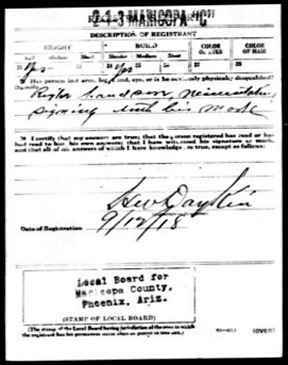 This attached draft registration was taken down while he was living in Phoenix. I know it is him, though, because his listed Next of Kin is VERA, who was from Indiana, his daughter by his FIRST wife. She much later married a gentleman by the last name of Harvey. He was apparently (per his draft registration) living at the ANGELES Hotel on Center Street (I think that's been renamed CENTRAL Street now) in Phoenix at the time he registered. My grandmother often mentioned the COPPER QUEEN Hotel in Bisbee, so perhaps that was the "scene of the crime" where he was living when they met one another and married less a year after he filled out this form. They married on June 4, 1919, in Bisbee, per this online record here (which agrees with my grandmother's oral history, but, I believe, misstates his age by at least six years--that ONE in 41 should probably be a six, or maybe even a SEVEN, if the age on his draft registration (DOB: 11/20/1872) is even close to correct--and we do think it is, based on my grandmother's insistence that he was an OLDER man--"much older" is how she would put it!). Somewhere, we have the actual marriage certificate record--it will take some digging to find it, but we think this online information is pretty close. I honestly do not know if it was a long courtship or a short one--my grandmother was rather coy about those details, and it was only years later, and too darned late, that we figured out (Duuuh!) that her reticence had to do with the fact that she was apparently not married "in the church/by the priest" which back then, was apparently the Crime of the Century in some circles. My grandmother also told us--and there might be records, somewhere, of this-- that Charles Miller Hawley was an instructor pilot who taught the young men to fly in the run-up to/during the First World War, but that he was "too old to go himself." Near as we can fathom, and from everything we know--because my mother specifically ASKED-- he was NOT in the military--he simply was a civilian instructor. I have no idea where he undertook this, though--I do believe this might have predated their romance, or certainly their marriage, given the timeline that we know about. Charles Miller Hawley, from what we do know, courtesy of oral history, was originally from upstate NY, his mother was German, and we think her maiden name was MILLER. We seem to remember Anna telling us that he was nicknamed "Curly" owing to his curly dark hair. She also said he had very blue eyes. I have no idea if he was related to Alan Hawley--he's a "man of mystery" to us, and I'm just now starting out, now that I am retired with time on my hands, on this effort to learn more about him! It very well could be they are related, and caught the flying bug from one another! Since, as your link notes, Alan was an Episcopalian, apparently--it's quite possible, indeed! Anna, you see, was Catholic, and it wasn't just the failure to marry in the church that bothered her, but it was also a bit of a scandal that she married a non-Catholic (though we don't know for certain what his church affiliation was), and a DIVORCED guy, to boot. I rather think Old Charles may have worn the old religious affiliation rather lightly. In order to do that sort of work back then, with the element of built-in danger, I suppose one had to have a sanguine nature and a devil-may-care attitude. If Charles was ANYTHING like my father, he was a smart fellow, had a quick wit and an adventurous spirit, who liked seeing new places and doing new things (it's a family trait, really!). And he was a good guy. Oh, and a REAL CHARMER, too! My grandfather died in Arkansas in a freak accident in the early Twenties--around 1923, I think, or early 24 at the latest (she said her daughter was just a few months old when it happened--that's how I place the time). He was "wing walking" from what my Grandmother told me, and he'd fall off the wing, to the delight of the crowd, and land safely by parachute. Unfortunately, he landed on a phone or telegraph pole, and a gust of wind came along and slammed him into the ground. He died of his wounds shortly thereafter--at least, that's how I remember the story being told. My grandmother sold his plane and came home to family, before the days of social security and so forth. Thanks again, Ralph--hope you can make sense of my hurried ramblings! If anyone who visits your website knows anything about him, it would be swell to hear! ONLINE RESOURCES If you search for "Charles Miller Hawley" using the Google search engine, (6-11-08), you will find just two links. They are both links to Rootsweb where Kim has submitted brief biographies of her family members, including her grandfather. The most important elements of his life and career are summarized in the article she wrote for this page.